Unlike his opponent though, Rahul Gandhi, president of the Congress Party, has equity exposure mainly through mutual funds. NEW DELHI: BJP President Amit Shah, who was a stock broker by profession before jumping into active politics, owns hundreds of listed and unlisted stocks, key among them being RIL, TCS, Bajaj AutoNSE 0.09 %, Colgate-Palmolive, Grasim, HUL, L&T Finance and UltraTech CementNSE 2.71 %, among others. 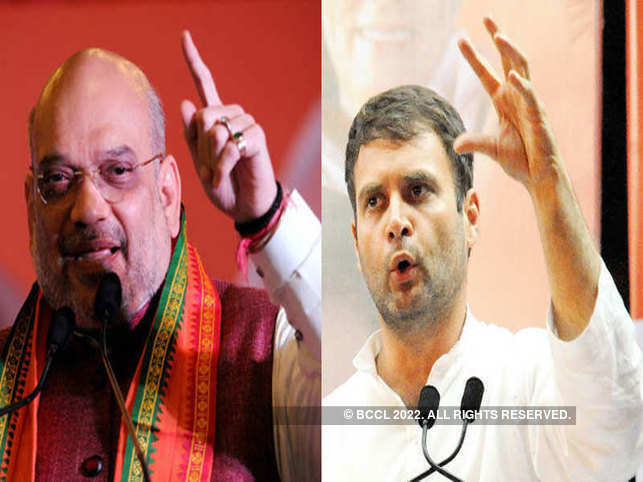 His affidavit, filed with the Election Commission of India (ECI) as part of his nomination papers for the Gandhinagar Lok Sabha seat, shows Amit Anil Chandra Shah held listed shares worth Rs 17.56 crore as of March 22, 2019. Unlike his opponent though, Rahul Gandhi, president of the Congress Party, has equity exposure mainly through mutual funds. His affidavit for the Wayanad constituency shows his investments are in mutual funds only instead of directly holding stocks. Shah also has exposure to Rs 3.08 lakh worth of unlisted shares. His wife holds listed shares worth Rs 4.35 crore and unlisted shares worth Rs 1.58 lakh. Overall his net worth stands at Rs 30.49 crore while his wife Sonalben Shah has assets worth Rs 8.35 crore. Shah has a widely diversified stock portfolio comprising mostly midcap stocks, though he also has substantial exposure to largecap plays like SBI, TCS, RIL, Tata Motors, Nestle, L&T, Maruti, Hindalco, ITC, HUL and many others. His wife’s stock portfolio is equally diversified, comprising many stocks common with her husband with very few new names. Amit Shah’s portfolio does not include any shares of the Adani Group companies. He owns just over Rs 1 lakh worth of shares in Reliance Communications, Reliance Capital, Reliance Home Finance and Reliance InfrastructureNSE 0.53 %, companies owned by Anil Ambani. Rahul Gandhi has investments worth Rs 5.19 crore in 10 mutual fund schemes. Among other movable assets, Gandhi has Rs 40,000 in cash, Rs 17.93 lakh in bank savings, Rs 39.89 lakh investments in financial instruments and Rs 2.91 lakh worth of jewellery, taking the total worth of his movable assets to Rs 5.80 crore. His immovable assets are worth Rs 10.08 crore and liabilities amounted to Rs 72.1 lakh.